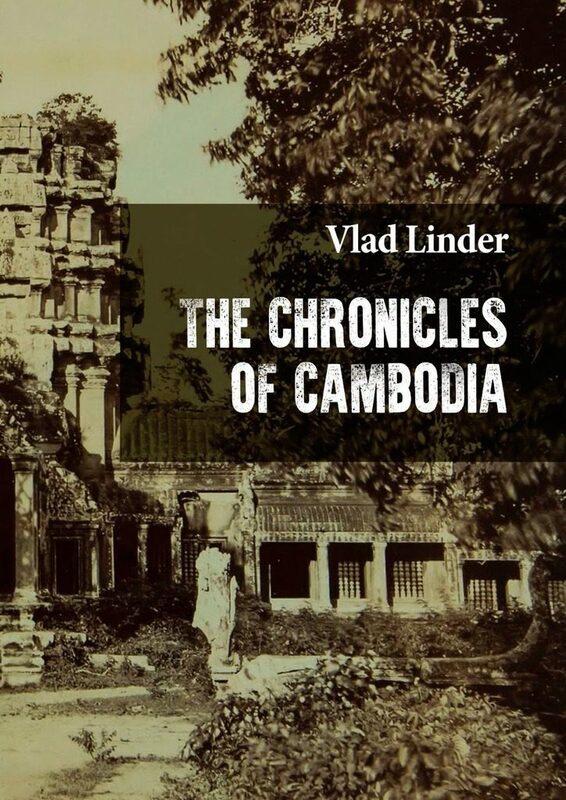 One can travel in different ways: observe the surroundings comfortably through a car window, or blend into the local people’s lives, experiencing and going through their pain and joy, troubles and concerns, just as the author of ‘The Chronicles of Cambodia” did. 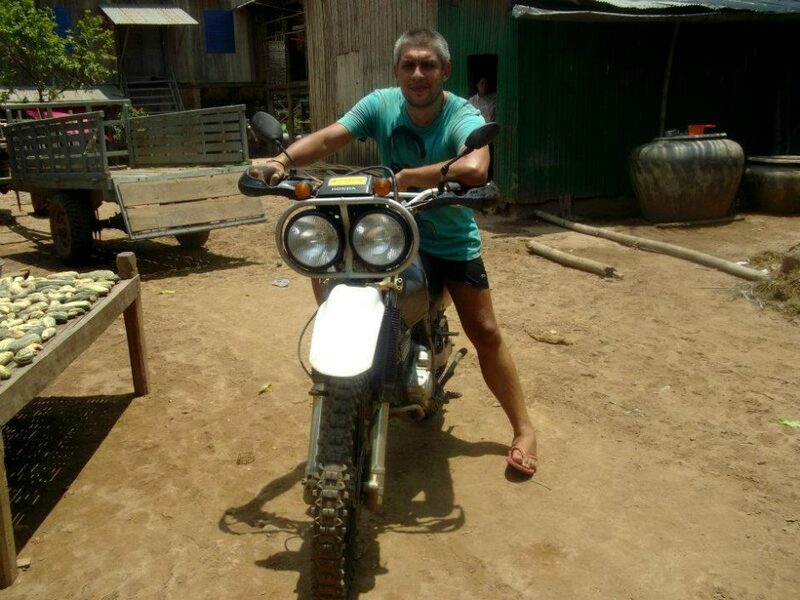 Vlad Linder describes in detail his journey to the land of The Khmer Rouge, which took place in April 2012 . . ..
A week after my arrival in Sihanoukville, I was rather tired of the predictable life of a settled tourist. Staying at a snug little house right on the shore of the Gulf of Siam, I kept feeling I was looking at the world through a well-polished, barely visible glass. I set off to a place, where you could hardly hear a foreign tongue and where you wouldn’t have pancakes with strawberry jam for breakfast. After roaming several miles away from popular tourist places, I found myself on a plain narrow cobblestone street packed with small hair salons, bars and various street food stalls. I turned from the main street onto one of the numerous side streets, walked several yards along a high brick wall and was happy to discover a cozy courtyard surrounded by three houses. On one of the porches several middle-aged women were sitting absorbed in a cash card game. At the same time they were giving instructions to the pedicurists almost lying on the ground at the women’s feet. I addressed one of the players with a question, if she had a room for rent in this wonderful and peaceful nook. Her card partner gave an affirmative answer at once and invited me to see the place. Having negotiated the price for a while, I paid several tens of dollars and became a rightful tenant of a tiny room located on the ground floor of one of the three houses, overlooking a piece of a brick wall and a narrow strip of the sky as a perk. The delighted landlady handed me a heavy padlock and a small key, hurried back to the game and placed all the rental income on a bet then and there. At any time of the day or evening she could be seen at the same place with the same people and engaged in the same fascinating pastime. However, it was rather convenient, especially when I needed her to solve some household issues. The next day I was walking back from a nearby market in a cheerful mood, when I saw the usual company, but the atmosphere was completely different. Instead of lively amusement usually accompanying the thrill of the game, I saw everybody with cards put aside, their heads shaking from time to time. They were all ears, listening to a woman from the neighborhood, who was telling something and sobbed violently. Her red tearful eyes searching for support said it all. I offered the girl some water and asked what had happened and how I could help. Weeping and trembling in emotions, she answered in a rather good English, as far as I could judge, that she needed badly to get to her family house situated 236 miles away from here as soon as possible. The locals couldn’t help – they mentioned lack of time or ‘important’ gambling affairs. I decided not to go deep into the story, but asked her to stay there a few minutes. I took the stuff I’d bought out of my backpack and filled it with the essentials we would need for a trip. A few minutes later our tuk-tuk rattled down the cobblestone road to the nearest bus station, bouncing and swinging, bumping every pebble and pothole. It turned out the bus tickets had been sold out, so we had to make the first 155 miles to the Cambodian capital in a small old Toyota together with several more passengers. Mile by mile my neighbor kept us immersed in her sad story. An hour before our first meeting she found out that one of the three brothers of hers had had a motorbike accident. A paramedic, who had arrived in an ambulance to the accident scene, was the first to let her know about the tragedy. The three young boys were taken to the closest district hospital. There were several phone calls from the doctor while we were on our way. Each call made the gleam of hope in her eyes get dimmer and dimmer. She fainted twice in my arms: the first time – when she heard one of the injured had deceased without regaining consciousness, and the second time – when she was told her 19-year-old brother had passed away. None survived. ‘‘I will never pray to Buddha again,’’ she whispered weakly in her mother tongue, slowly regaining consciousness, her eyes still closed. I will never forget what I felt, when I heard those words slipped out of her heart in despair. Emptiness filled all the inner and outer space, like ink spreading over a blank piece of paper. The bright day gave way to a black night. The only sound I could hear in the darkness was the thud of my own temples; the pain in my chest meant my heart was still alive. The sky, usually distant, airy and light, now came crashing down on me. It is always unbearable to see the hope and faith die, but if love dies, the heart turns to stone forever. Her love was strong. At last we covered the most part of the distance. In the capital we dropped by one of the numerous bike rentals and, following my companion’s advice, I took a Honda sportbike with studded tires. It reminded a racing greyhound – slim, high and slightly arched. When I straddled the bike, my feet could barely touch the ground. Sixty odd miles at 95 degrees Fahrenheit was a tough challenge, I must say! Furthermore we had to maintain a high speed to arrive before dark. When the asphalt road ended, we made a stop before the last and the most challenging part of our trip. My hands trembled as if electricity had passed through them. My T-shirt and shorts were drenched in sweat. The ride was immortalized in an exhaust pipe burn on my leg. The girl coped with the situation quite well in spite of what she had been through. It had rained in the province the night before, so a once normal country road had turned into squelching mud, however a little sun-dried. The bike, bored with the asphalt road, now shuddered in anticipation of impassability and started getting its studs into the ground so furiously, that huge lumps of mud splashed yards away in all directions and onto us. For the first time since the beginning of our trip I looked around to see a real Cambodian village. Dozens of kids playing outdoors, peasants tired after the work day, and jolly drunks – as soon as they noticed us, they all greeted us cheerfully and waved. We had to move slowly and carefully, trying to avoid huge puddles and boggy places, where indifferent tall herons were standing still, domestic ducks were scampering around with their ducklings, dogs were barking, and white cows were walking solemnly with their calves. Smoldering fires were seen on both sides of the road. The smoke formed white vaguely-outlined arches. When, amidst an endless field of tobacco, a young stallion galloped out of one of the arches all of a sudden, its bell on the neck ringing, crossed the road in three long jumps and disappeared in heavy smoke in a blink of an eye, I thought it was hallucination, as the picture was quite surrealistic. Having overcome all the obstacles we reached the ferry. My companion’s home village was right across the river. We got down to the water along a stony but easy trail in complete darkness. Without cutting the engine I directed the headlight at the opposite bank and honked several times. The opposite bank answered with a starting engine, and after some time a big floating structure took us onboard. The ferryman was a very young boy sitting on the edge of the boat and hugging an old diesel motor fastened to one of the crossbeams with wire. On my way back after several days, I noticed how serious and responsible the boy looked. His daily important mission of taking people across the river made him a grown-up beyond his years. We paid half a dollar and crossed the river. A local brindle dog was the first to greet us near the house. It barked crazy and ran around us in circles until I got off the bike and let the dog sniff me. Nuzzling its wet nose into my legs, it found the fresh burn on my left calf and started licking it enthusiastically. That was how we made friends. The rustic courtyard was lit by the only fluorescent lamp. Its cold light covered only the central part of the courtyard, not reaching the remote corners. They had electricity for several hours a day starting from 6 p.m. – it was rather expensive, so one bulb per house was a matter of course. People from the neighborhood gradually filled the courtyard and encircled us. When I realized I was still wearing the helmet, I got rid of its stuffy and tight embrace, and appeared at my best before the spectators. All over in mud, my bristle almost as long as my hair, and soaked in sweat, I was standing there, in the middle of nowhere, lit by an electric moon, looked at by dozens of attentive eyes. When it turned out that I was the first foreigner ever visiting this village, I felt ashamed for my appearance. I looked around smiling guiltily, which caused excitement, and everybody present – from kids to old people – smiled back. The people gave way to us, I made several steps and sank to the stairs leading into the house. My companion brought a pot and a bar of soap, and pointed at a row of big jars with water seen here and there in the courtyard. ‘‘Grab any and wash yourself,’’ she said. I turned round the corner of the house, where nobody could see me, and poured half a big jar of warm rainwater over myself. While I was tampering with the pot, cleaning one spot and soiling another at the same time, they made a dinner and bed for me. So many things had happened during that hard day! I went up the stairs into the house, expressed my gratitude for the dinner and fell asleep immediately, enveloped in the delicate smell of tobacco leaves cured downstairs. The population of this and many other neighboring villages made their living by growing and curing tobacco, and preparing it for further export to Vietnam. When I woke up the next morning, I realized I had fallen ill. The planned return trip was postponed. I was down with fever the following days, coughing and sneezing vigorously. At the same time I saw the family making arrangements for a funeral. The girl’s relatives lavished care and attention on me, as if I were part of the family. One after the other they gave me ginger tea and lime drink, rice and mango, telling me about their hard life in the village. Soon I got well, and we started back after several days. I left the house with a heavy heart. I got used to the people who gave me shelter, and got a taste of the joy and grief of real life. Life goes on! Vlad Linder writes, “Several years ago, I undertook a long journey through an amazing country that touched my heart from the first day I set foot on its soil. And that was Cambodia.” Having visited more than 30 countries, he says he is “a fervent traveler and an aspiring writer.” He has published this, his first book, as as as an ebook on Amazon, eBay, Google Play and iTunes.